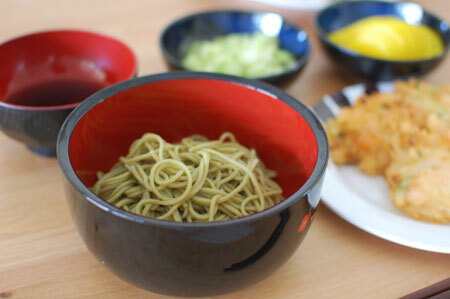 A summer staple food in Japan – cold soba noodle with dipping sauce. Great to eat in a hot day! 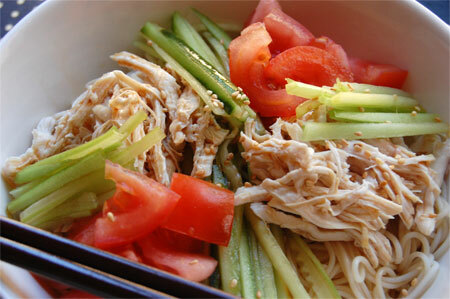 There are few different types of noodle you can use for this “cold noodle + dipping sauce” dish. Soba, udon, somen, and chu-ka noodle. What are the differences? 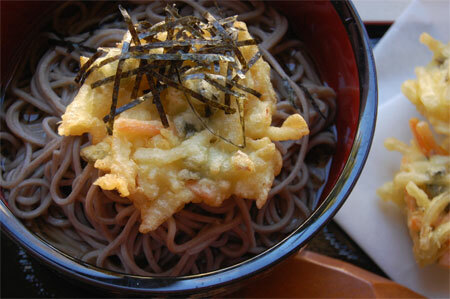 Soba is made of buckwheat, and is grey-ish colour. 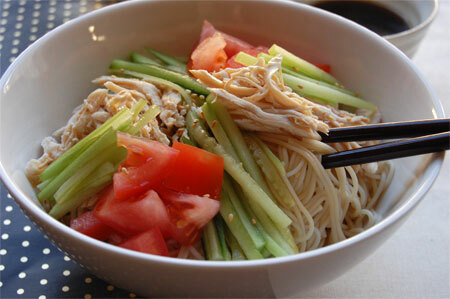 Somen is very thin white Japanese noodles made of wheat flour, less than 1.3 mm in diameter. 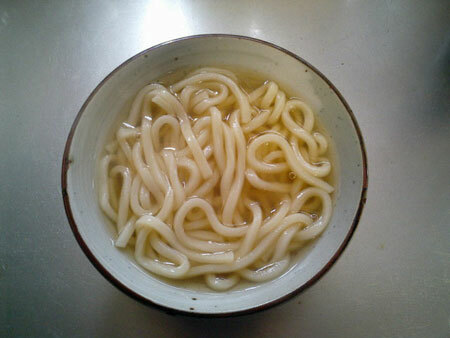 Udon is a type of thick wheat flour noodle. 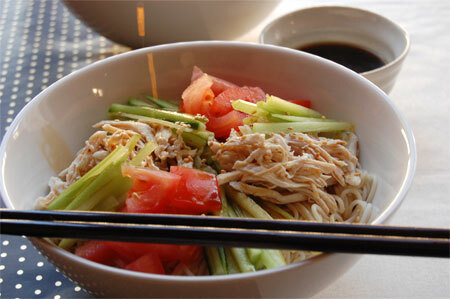 Chu-ka noodle is egg noodle which is often used for ramen. At my house in Japan I used to eat udon a lot. I seldom ate soba while I was in Japan (and now still) – I’m not sure why it is, but I guess it’s because people near Kansai in Japan eat more udon than soba noodle for some reason. Here in Perth I got some cha-soba noodles from a local Asian shop. Cha-soba noodles are soba noodles made from buckwheat and wheat flour with the added ingredient of fresh green tea leaves. You can smell green tea aroma from the noodle and they are really refreshing. 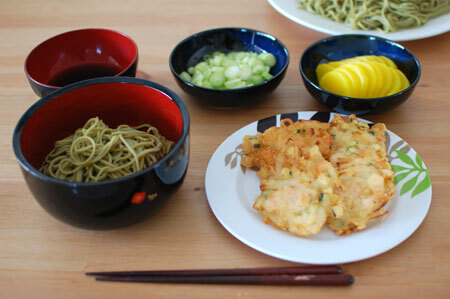 To accompany cha-soba noodles, I made some kakiage (mixed vegetables tempura) with chopped prawn. If you have tempura flour it’s super easy to make, but even if you don’t, it’s not that difficult. Mix flour, salt and water in a mixing bowl. Add the prawns and vegetables and stir. Heat oil in a shallow frying pan (about 3 – 5cm) to 170℃. Using two spoons, carefully drop the tempura mixture into the oil. Fry over medium heat for both sides. 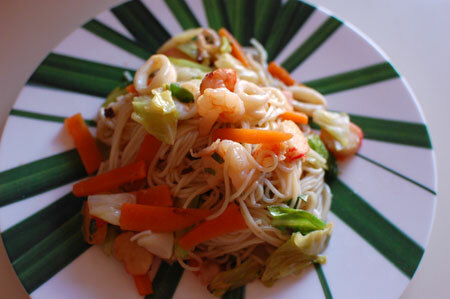 Serve with cooked cold soba noodles. 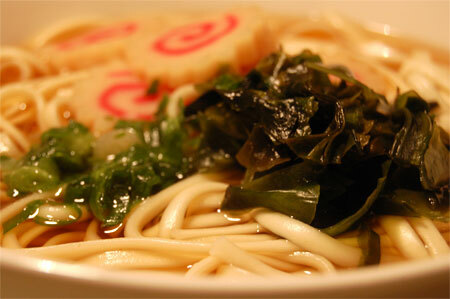 Somen noodles are usually eaten cold with dipping sauce, or warm in soy sauce based soup. Cold somen with dipping sauce and condiments is a popular dish in summer, and nagashi somen (I wrote about it here) is one of popular activity at summer festivals. The first time I ate stir-fried somen was in Okinawa, when I stayed there for one week to get scuba diving licence. I was 17 years old. Okinawa has unique foods and drinks compared to other parts of Japan (I wrote about it here) due to its history. 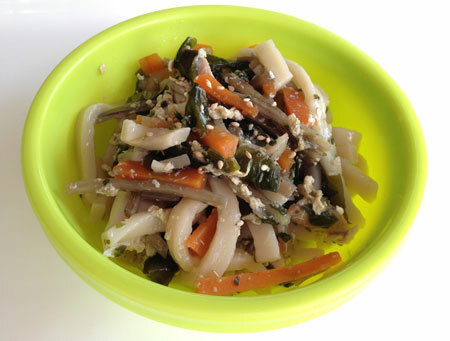 Stir-fried somen is called “somen champul (= stir-fried somen)” in Okinawan language. I ate it at an izakaya along with other unique Okinawan dishes, and they were all delicious!! 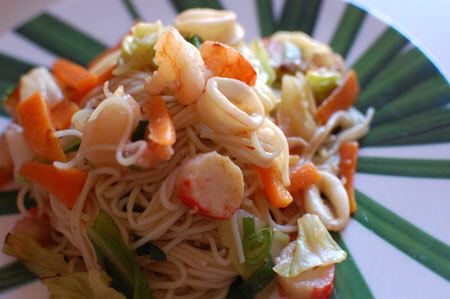 I made this with seafoods, but you can use meat such as pork, beef and chicken instead. This recipe is not like the one I ate in Okinawa (they use pork), and it doesn’t taste like typical Japanese food. I guess it’s because of oyster sauce and fish sauce I added. The key to make this dish is to wash the somen noodles very well then drain before adding to the frying pan. Boil water in a deep pan, and cook somen noodle to al dente. meanwhile, cut the ingredients: cut cabbage into 3cm cubes, cut carrot into 4cm-long thin batons. Chop garlic. Slice prawns into half. Slice crab sticks and squids. Once the somen noodles are cooked, place into a strainer to drain. Wash the noodle by rubbing them with hands under running cold water until the slimy gluten is gone. Drain well. Place garlic and 1 tbs of oil in a frying pan, and turn on the heat. Once aromatic, add ginger, prawn and squid. Stir-fry for 1 minutes. Then, add carrot, cabbage and crab stick. Stir-fry for 1 minutes, and pour soy sauce, sake and oyster sauce. Add somen noodle to the pan, and stir quickly. Drizzle sesame oil and fish sauce over, and scatter spring onions. Turn off the heat. Serve immediately. 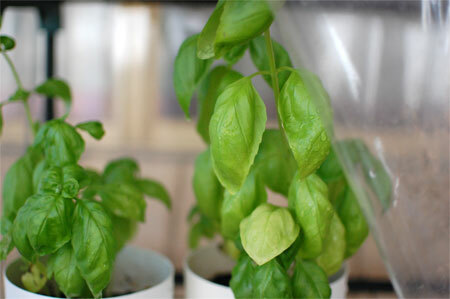 The basil we sow about few months ago is growing big now! 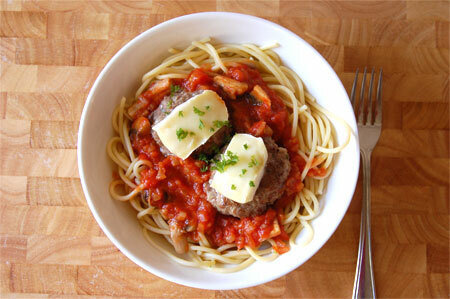 I had a pack of beef mince in the freezer, so I decided to make meatballs using the basil leaves. 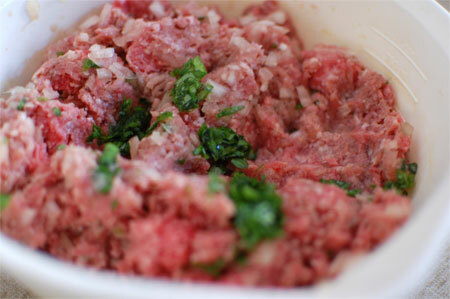 I chopped up the leaves finely and added to the meatballs along with onions. 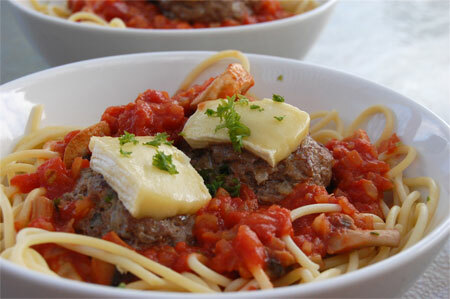 Although I like meatballs with half pork half beef, this time it’s 100% beef. 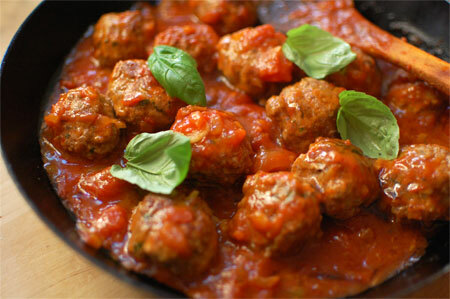 It was still good, the delicious sizzling smell hit my nose as soon as I started grilling the meatballs. Fresh basil is so great for tomato based sauce. I added about 15 leaves to the mince, but I could add more, actually. I was bit stingy! Chop up the onion and celery finely. Place half of the onion into a mixing bowl with beef mince. Chop up basil leaves. Add to the bowl. Season with salt and pepper, and mix well. Slice garlic thinly. Heat 1 table spoon of olive oil in a sauce pan, and fry garlic until fragrant. Add the rest of the onion and the celery to the pan, and saute for about 3 minutes. Add tomato paste, and fry for few minutes, then add chopped tomatoes. Simmer for 5 minutes. Meanwhile, heat 1 table spoon of olive oil in a frying pan. Shape the mince mixture into little balls, and place onto the frying pan. Grill over medium-high heat until the bottom is coloured, then flip it around. Turn down the heat and cook further 3 minutes. 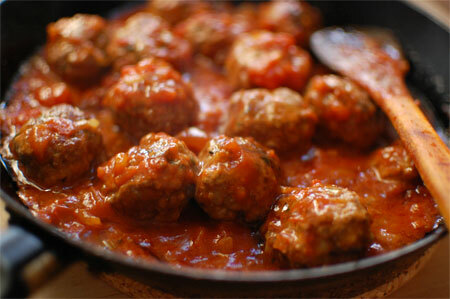 Pour the tomato sauce into the frying pan over the meatballs. Simmer for few minutes. 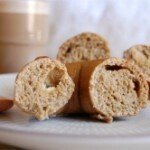 Enjoy with pasta or bread! I sometimes get a craving for tempura soba. 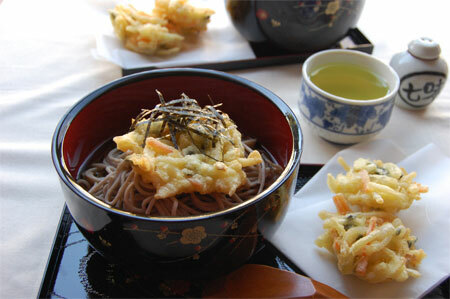 The combination of crispy tempura and freshly boiled soba noodle in warm, sweet, soysauce-based dark soup. In the area around my house (Shiga), we don’t eat soba much. We eat udon more often. 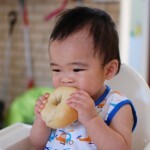 In Japan, the type of food people eat is different depends on where you live. 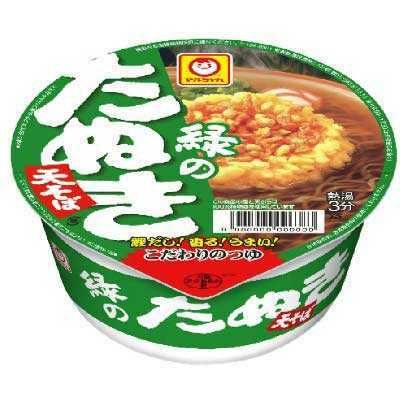 For example, Western people (eg Kyoto) use white miso for miso soup, but Eastern people (eg Nagoya) use red miso. Western people eat udon, but Eastern people eat soba. It’s not always black and white, some Western people eat red miso and soba noodle too, of course, but it’s what we say in Japan. In fact, my mum never cooked soba at home. It was always udon. But, in the New Year’s Eve, I sometimes felt like eating soba. As we eat toshikoshi-soba (people in Japan eat soba noodle at midnight between New Years Eve and New Years Day), I sometimes asked my mum to prepare instant soba noodle. I love this cup noodle soup… It’s so shame that Australia doesn’t allow these noodle to be imported. 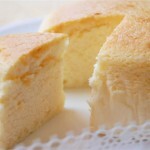 I just have to eat it in Japan. Anyway, I made tempura soba the other day and it was really nice. 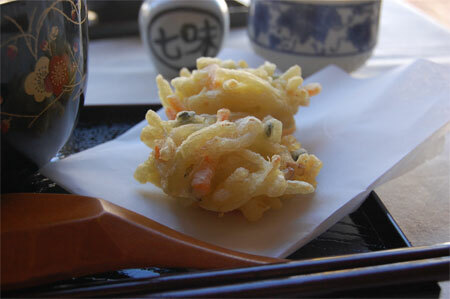 You can follow the recipe for crispy tempura here. I made kakiage – tempura of mixed shredded vegetables. It’s so easy to make! Thinly slice onion and carrot (and chopped spring onion or shredded burdock roots if you want). 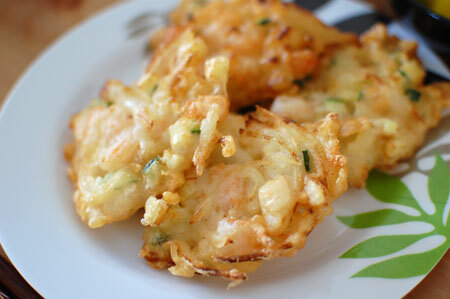 Coat with tempura batter, and drop into hot oil using two spoon to make a round shape. Make it flat, so that the tempura get cooked through and crispy. 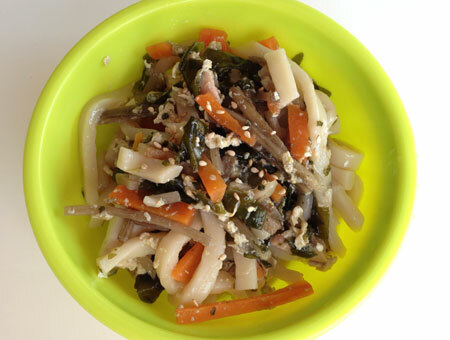 To see how to cook soba noodle, refer here. The oil from the crispy tempura gives the nice flavor to the soup (^-^). Yaki Udon (fried udon noodle) is normally cooked with thinly sliced pork, onion, carrot and bonito flake (similar to yakisoba), but I wanted to try something different. The ingredient doesn’t have to be always same, right? 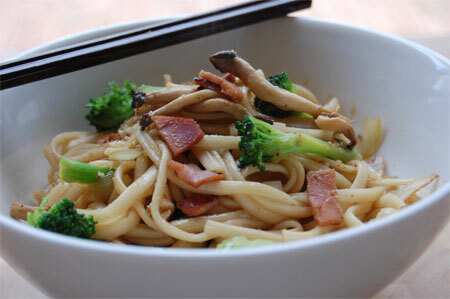 Crispy bacon and the garlicky sauce add unique flavor to the udon noodle. 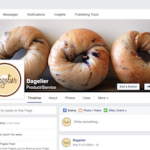 Why not try making it tonight? Boil a pan of water and cook udon noodle. Drain, and set aside. Slice onion and garlic. Cut broccoli into small pieces. Cut the stem from the mushroom and separate. Trim bacon, and chop up. Heat 1 tbs of oil in a frying pan. Fry bacon for 2 minutes. Add onion, garlic and mushroom. Saute over medium heat for 2 minutes. Add broccoli, then water to the pan. Turn up the heat to high. Loosen up the udon noodle under running water, drain, and add to the pan. Add soy sauce and oyster sauce. Stir-fry until combined. Mix through the bonito flake, or garnish on top. ＊ Udon noodle sticks to the pan easily, so any liquid in the pan helps. Bring the large pot of water to the boil, and cook somen noodle. Drain and set aside. Peel a part of the skin on baby eggplants. Halve lengthwise, then cut each halves into 1 cm. Leave them in a bowl of cold water. Cut chicken into pieces. Chop onion and garlic. Slice cup mushrooms. Separate shimeji into small pieces. In a large frying pan, heat 1 tbs of olive oil and grill the chicken. When it’s coloured, add garlic, ginger and onion and saute. 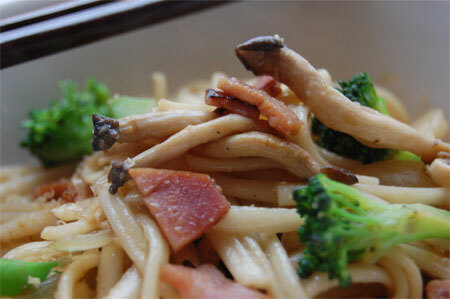 Add mushrooms, and saute for few minutes. Add curry powder, and cook for another few minutes. Drain the egg plants and add to the pan. Pour sake, chicken stock and tomato into the pan, and bring to the gentle boil. Reduce the heat, add a bay leaf and place the lid. Simmer for 10 minutes. Season to taste. 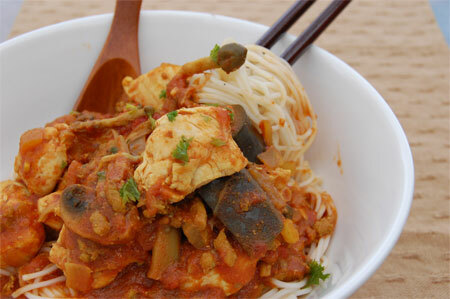 Divide the somen noodle into the serving bowls, and pour the curry over. Serve while hot. 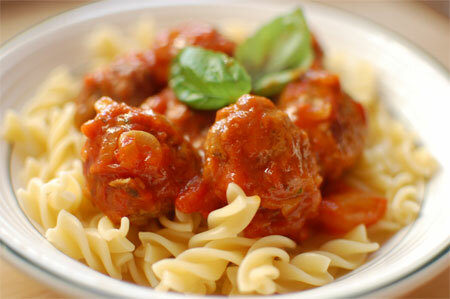 Meatball pasta!! Everyone’s favorite 🙂 Add Mozzarella cheese to the big size meatballs and enjoy the mild, melty texture on delicious juicy hamburg. Mix the mince, onion, breadcrumb and a pinch of salt in a bowl until well combined. Divide into 8 and shape them into balls. Stand-by in the fridge. Chop onion, celery and carrot. Slice mushrooms. Heat 1 tbs of olive oil in a medium sauce pan, and saute onion, celery, carrot and garlic until fragrant. Add tomato paste and saute, then add tomato tin. Bring to the gentle boil, then reduce the heat to simmer for about 10 minutes. Place margarin in a frying pan, and heat over medium-high heat. As the butter start to sizzle, add mushrooms and saute. Sprinkle a pinch of salt, and remove from the heat. Add the mushroom into the tomato sauce. Bring a large pot of salted water to the boil, and cook pasta. Meanwhile, heat the same pan with 1 tbs of oil. Flatten the centre of the meatballs, and sear one side. Flip the meatball around, reduce the heat, and place a lid. Grill until cooked through. Slice Camembert cheese into 8. Remove the lid, and place the Camembert slices on each meatball. Place back the lid, and turn off the heat. leave it for 1~2 minutes. Arrange pasta in each serving plate. Pour tomato sauce, and top with 2 pieces of hamburgs.